Local residents are being urged to consider participating in a state-run gun buyback program going on next weekend, through which cash payouts of up to $200 per firearm are being made available to members of the public, acting Union County Prosecutor Grace H. Park, Union County Board of Chosen Freeholders Chairman Bruce H. Bergen, Union County Sheriff Joseph P. Cryan, and Union County Director of Public Safety Andrew Moran said in a joint announcement Thursday. The event is being held from 8 a.m. to 8 p.m. on Friday, July 28 and Saturday, July 29. One of the three locations for the buyback, being coordinated by the New Jersey Office of the Attorney General and the U.S. Attorney’s Office in Newark, is the Greater Abyssinian Baptist Church on Lyons Avenue in Newark – a site just several blocks from Hillside and a short distance away from numerous Union County municipalities. The other locations include Antioch Baptist Church on Ferry Avenue in Camden and the Friendship Baptist Church on Perry Street in Trenton. New Jersey residents can turn in up to three firearms of any type, no questions asked, and receive payouts of $100 for a rifle or shotgun, $120 for a handgun or revolver, and $200 for an assault weapon. Police officers and law enforcement firearms experts will be on hand to assist with the valuation and securing of turned-in weapons. Since 2013, two law enforcement-run gun buybacks were held in Union County, resulting in the collection of nearly 1,500 firearms. “Tens of thousands of Americans die each year from gun violence, and having fewer guns around could mean they won’t end up in the wrong hands, including our children,” Freeholder Chairman Bergen added. The Attorney General’s Office is paying for the gun buyback with forfeiture funds obtained by the New Jersey Division of Criminal Justice, the New Jersey State Police, and the three participating County Prosecutors’ Offices, in Camden, Essex, and Mercer counties. Payouts will be made on a first-come, first-serve basis. The gun buyback was first announced during a press event in Trenton held earlier this month. In addition to the gun buyback program, Acting U.S. Attorney for New Jersey William Fitzpatrick and New Jersey Attorney General Christopher Porrino announced an enhanced commitment to coordinate state and federal efforts to prosecute gun crimes aggressively, with a particular focus on the “Triggerlock” program, under which high-priority gun offenders arrested by municipal police or state authorities are referred for prosecution by the U.S. Attorney’s Office under federal law. This typically means lengthier prison terms, including potential penalties of 15 years without parole to life for the most serious gun offenses. “Our joint efforts to take guns off the street – whether it is through the Attorney General’s buyback program or our coordinated prosecution of firearms offenses and violent gangs – demonstrate our shared commitment to use every strategy, investigative technique, and resource to protect the communities we serve,” Fitzpatrick said. The gun buyback has also been promoted through radio, newspaper, bus transit, social media, and other advertising throughout the month. 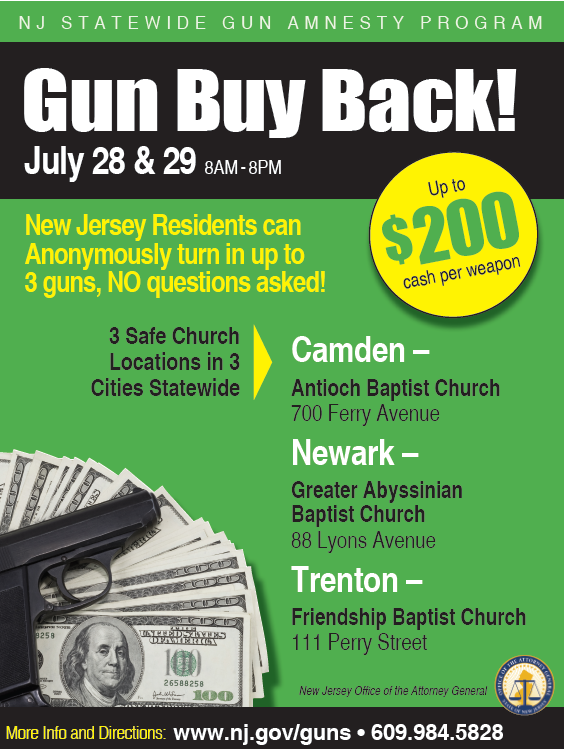 Any resident with questions about the buyback effort can call the Attorney General’s Citizen Services unit at 609-984-5828 or visit www.nj.gov/guns; frequently asked questions and answers can also be accessed online at http://www.nj.gov/guns/faq.html.